Your password should be more than 9 characters in length, it should contain a combination of uppercase, lowercase, symbols, punctuation’s and moreover you should not use password that can be easily guessed like common words, real names, substitutes etc. All such rules and instructions can be seen in secure websites like online banking, online shopping sites, Gmail, forums, social networks etc. In order to make your password difficult to crack and to highly protect your online content most sites recommend you to set strong passwords. How many different passwords can you remember in your mind; one, two, three not more than that? It is really very hard to remember passwords for every websites that you use day to day. So you can save all the passwords in a text file or you can even save it in your mobile phones and when you revisit the website you can use it to enter the login details. But that’s not a good idea; instead you can make your web browser to remember passwords, so when you revisit that particular webpage browser will automatically fill out the login details. 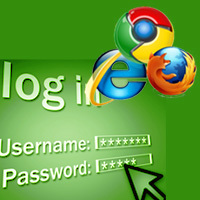 Here let’s see how to enable or make Google chrome, Firefox and IE browsers to remember passwords. When logging into a site you might have noticed a popup window or a notification window that will have options like “remember password for this site” “not now” and “never remember password for this site”. Here we will see how to save passwords in chrome, Firefox and Internet Explorer. In your chrome web browser when you login to any site you will see a popup message at the top of the browser. For example login to your Gmail, Facebook or any account in any website and you will see a message like this that says “Do you want Google chrome to save your password”. Just click on save password and your chrome browser will stores both the username and password. When you revisit the webpage again, Google chrome will automatically fill the login details which saves you time. In Google chrome by default this option is enabled that is whenever you login to a site, you will see this message. If you have already saved the username and password for a webpage, then you won’t see this. In case if you don’t see the saved password and don’t get this option for any websites then here is how you enable remember password option in chrome web browser. Drop down the chrome menu icon at the top right corner and then click on settings. Now scroll down and click on advanced settings. At the bottom you will see passwords and forms, just check both “Enable Auto fill to fill out web forms in a single click” and “Offer to save passwords I enter on the web”. Now restart your chrome browser and you will see remember password message when you login to a site. In case after enabling the option, if you still didn’t see it then you might have checked “never for this site”. If you check never for this site then Google chrome will never show the option to remember password, here is how you undo it. Drop down the menu icon click on settings >> show advanced settings and in passwords and forms click on manage saved passwords. Now you will see an area with a list of sites that is never saved, just remove every websites from that list. Hope this helped you to save passwords in Google chrome. In Firefox when you login to a site you will see a message like this one below. Even though if you have ignored (not now) the message then you can simple click on the key icon to get it back. Clicking on remember password will save your username and password. Clicking on never remember password for this site in Firefox will never get you this option for that particular site until the exception is removed. Drop down Firefox menu icon, go to options and then choose options. Now you will have several options, just click on security tab and in passwords field check on “remember passwords for sites” which will get you that save password option for each and every site. In case if you have checked “never remember password for this site” in Firefox then here is how you remove that exception. Drop down Firefox, go to options >> options. Now move on to security tab and then click on exceptions in password area. Now you will see a list of websites for which passwords will not be saved. Just remove everything, click on OK and then restart your Firefox, that’s it! Hope this helped you to make Firefox remember your username and password. Internet Explorer is little different than both Chrome and Firefox. In Internet Explorer when you enter you login details you will see a message at the bottom of your browser that says “would you like to store your password for this site”. If you click yes then Internet Explorer will save your password and when your revisit that particular webpage, IE will automatically fill the login details. To enable IE to save your password, drop down the settings gear icon at the top right corner and then click on Internet options. Now move on to content tab, open auto complete settings and in there check “usernames and passwords on forms” and “ask me before saving passwords”. In case if you have selected “not for this site” then there is no other way to undo your decision. If you later change your mind and wish to store passwords in IE then the only option you have is delete all previously stored passwords and history. Hope this post helped you on how to make chrome, Firefox and IE web browsers to remember passwords. Please share it and to get more updates, follow us on Twitter.